Travel is a metaphor of life, with all life's joys and sorrows, births and deaths. In feudal Japan, the Tokaido connecting Edo(Tokyo) and Kyoto over a distance of about 600 kilometers, was the most important road with the highest volume of traffic. It had 53 barriers and these were known as the 53 stages of the Tokaido. 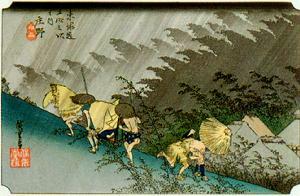 The Tokaido ran across rivers and through mountain passes and for a good part of the way was a coastal route. 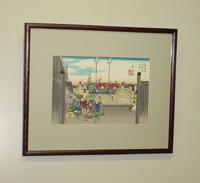 Hiroshige drew more than 30 series on the Tokaido. The best of them is the Hoeido version of the "53 Stage of the Tokaido". This series of the 55 pictures catapulted him into the first rank of ukiyoe painters of the day and secured his fame for times to come. In this series, Hiroshige uses mountains and rivers the moon and snow, rain and wind, to delicately express the sentiments of travelers. These are not mere landscape pictures, but poetic expressions of nature. They are unparalleled among the lyric landscape paintings of Japan. Copyright © 2003 アートショップ　All right Reserved.